← Stop! The Heart You Save May Be Your Own. Does Unconditional Love Have Conditions? Yes! Many of us talk about such a love, but what we do not give much consideration to, is the person on the receiving end of someone who has unconditional love, should not willfully provide horrible, even impossible “loving” conditions. For example, you should not punch love in the eye and push the limits of unconditional love to stay within continual opposing and hostile conditions. Take a look at God. Believers attest to the infinite love of God. It is unconditional. (Stay with me here.) God loves you and will abide with you until the end, but if you put yourself in a sinful condition, then God will leave you. This is a condition. Live free from sin, and God will abide. Choose to live the life of sin and God must depart. You have created conditions in which God cannot dwell. He still loves you unconditionally, but He just cannot abide with you. Although… is this what we define as unconditional love? It is not unconditional, if it leaves— regardless of what condition. Right? In truth, even the unconditional have conditions. With everything there are conditions. 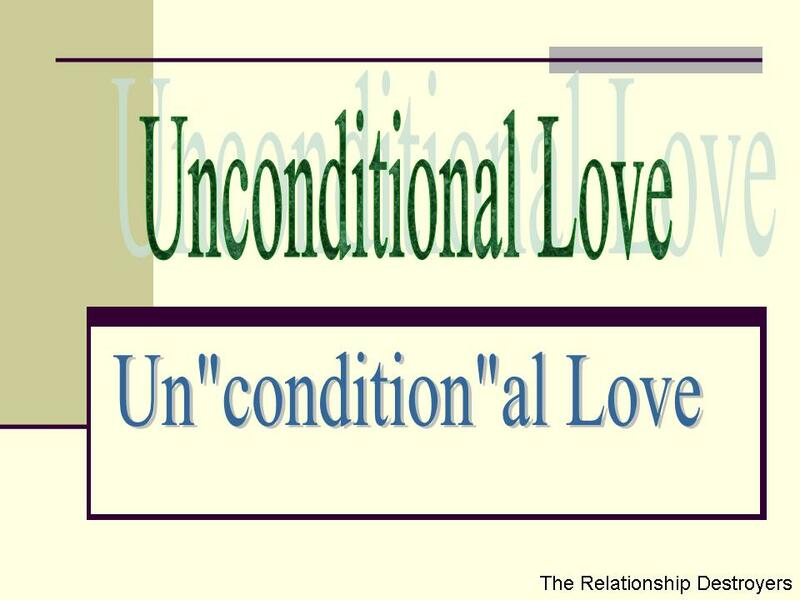 The root word of unconditional contains condition. How can something be totally free from something, yet contain some form of what it is to be free from? This means that in some form of unconditional, it cannot truly exist without conditions. If this theory is correct, then is there anything “unconditional”? Okay, besides a true Mother’s love. Why are there marriage licenses? To legally bind two people who have proclaimed their love in the presence of God, an authorized official who can marry two people in matrimony, along with two or more witnesses. No one says marriage vows are unconditional, but they are. Any solemn promise that goes to the end of life is indeed unconditional. Making a promise up to the moment of death is unconditional. The vows are a binding verbal agreement (verbal contract) of how we will govern ourselves in marriage. They are verbal expectations, regardless of the horrible conditions like: in sickness and health, denying all others, etc, and until death do us part. Regardless of how bad the conditions in the marriage may be, the word of those two partners is unconditional. The success of marriage is contingent on keeping the vows. Breaking the vows uproot the unconditional promises of the marriage. I would argue that many of us have unconditionally loved, at least once, in our lives. It could have been that first love; or that very special someone that had your heart, to the point, where it didn’t matter what he/she did, you were taken away with your love. When that person took you through long enough, and caused you great pain, it took you a long time to get over it. It is through the pain, the backlash of a past love’s residue, and the experience of a broken heart from our unconditional love, that we learn we MUST create conditions. We must create a boundary of how much of our love to measure out to someone new in our lives, in order to have some sort of emotional security and inner control. For we have learned, from the unconditional lesson that when we are investing in the equation of love, we need assurance that the object of our love will provide the same type of emotional investment, at the very least. We live, for the most part in a civilized society. When we enter a relationship, after having the experience of loving unconditionally, we bring with us internal conditions by which we have lived or experienced— good or bad. We learn eventually that without conditions there are no measurements. Without measurements there is nothing to be truly governed by, and there is nothing to guide others by on the journey of love. Finally, unconditional love is mostly always met by conditional love. The turbulence of this equation will cause the unconditional one to require better conditions. This is why a person who has unconditional love, and one who has conditional love, are rarely successful in a relationship together. The focus is lost in the unconditional loving partner trying to continually tolerate unloving conditions, until that toleration becomes intolerable. This entry was posted in Knowledge and tagged a relationship with unconditional love, loving unconditional, unconditional love, unconditional love does not really exists. Bookmark the permalink. 1 Response to Does Unconditional Love Have Conditions? Yes! Unconditonal Love has conditions, yep, thats about right, there is balance in this force.